The design phase starts with keeping your desired learning objectives and outcomes at the center of every component of your course. While many educators and universities have started using the terms learning objectives and outcomes interchangeably, they are each rooted in distinctive definitions. When properly described through writing or multimedia, these elements will provide a foundation for the course and guide you in making appropriate curricular and assessment choices. Clearly expressing the objectives and outcomes informs learners as to what is expected of them. Learners can subsequently monitor their performance and learning against these stated objectives and outcomes. Bloom’s Taxonomy covers three areas: the cognitive, affective, and behavioral learning domains. 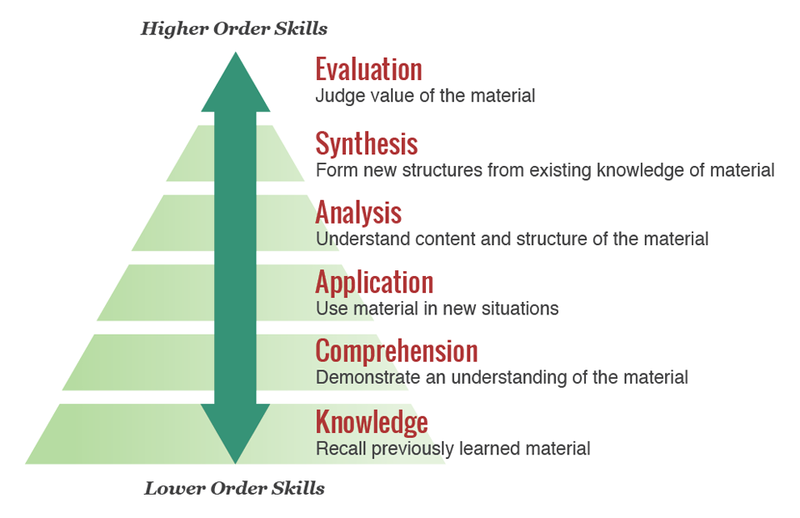 Each of these domains is further divided into levels of higher order thinking and performance, as seen in the accompanying graphic. Ideally, each of these levels should be represented in the learning objectives and outcomes you design for your course. These levels do not correspond with the difficulty of the subject matter in your course, but rather the level at which the learner demonstrates their mastery of the material. For instance, even lower level undergraduate courses can include evaluation and analysis activities. Learning outcomes are general statements that describe the essential learning (knowledge, skills, and attitudes) that learners will achieve by the end of the course. They should encompass the depth of the knowledge and skills that you will be ultimately assessing. When composing outcomes, be mindful not to combine elements that cannot be assessed by a single method. Outcomes are broader than objectives in the sense they apply to an entire course. Several objectives may align with and support a single learning outcome. When asked to solve a problem in primary education, the learners will be able to draw upon previous knowledge, theories, and concepts from their coursework to explain and demonstrate their solution. All learners will be able to explain the theoretic basis of Newton’s Three Laws of Motion, presented in their final portfolios. …are intended results of instructional activities. …are evidence that learning took place. …focus on specific types of performances that learners are expected to demonstrate. …specify what learners will know and be able to do as a result of the learning activity. …are teacher-centered in that they indicate the subjects the instructor intends to cover. …are learner-centered in that they describe what the student should learn.